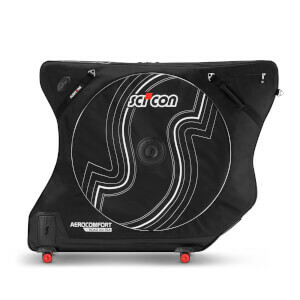 The Scicon AeroComfort Triathlon 3.0 TSA Bike Bag protects your bike from damage when travelling abroad on cycling trips. The design enables aero bars and the seat post to be kept in place to make packing and unpacking easy, with minimal disassembly and reassembly required. The triathlon bike bag offers high levels of protection, blending rigid protection shields to critical areas with reinforced and cushioned shell materials. Designed in collaboration with innovation partner TENTE, the durable Twin Wheel System improves rolling performance and manoeuvrability. Eight precision ball bearing wheels rotate 360° to keep the bike bag upright and easy to manoeuvre over any terrain. A detachable strap system allows for comfortable carrying. A lateral hub shield and layered HD foam padding protects the wheel hubs from jolts and knocks during transit by deflecting and absorbing impacts. 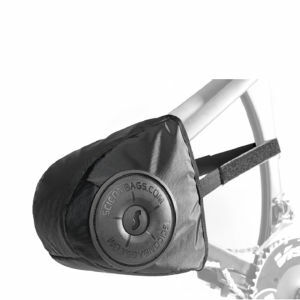 The bike bag has built-in rear mech shield protection to safeguard the rear derailleur from impacts and abrasions during the transit of your bike. An internal frame stand keeps your bike in place to protect your bike from impacts, while also enabling customs to inspect your bike without the need to remove anything. Compatible with 12mm front and rear thru axles, the Aerocomfort 3.0 bike bag includes four thru axle to quick release adapters. Great case, durable and very easy/intuitive to use. really good bike bag to take your bike abroad!! I love it you need to pack the bike carefully to avoid any damage on it, same with any other bike case. enough room for 2 pair of wheels and some of your kit. This is a very well engineered piece of cycling gear. This is extremely well engineered and a quality piece of equipment. The ease of getting-your bike in here and making sure it's secure is very easy. They do a great job of illustrating what to do built right into the bag. It comes with many extras and accessories to insure you can keep your bike from getting any abrasions. The dereaileur guard helps protect the major components of your bike. They have protectors for the aero bars too. The wheels move so smoothly it's hard to keep it from getting away from you. It is by far my favorite way to travel with my bike so far.